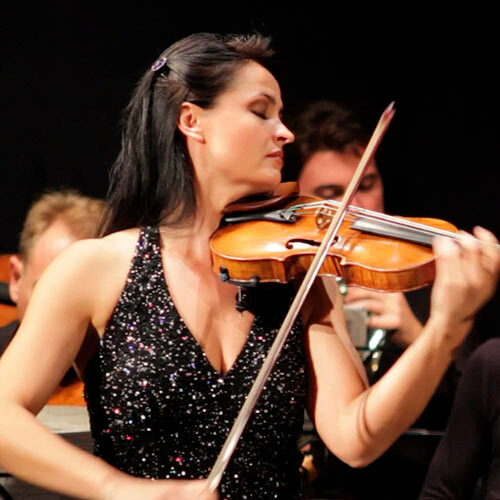 Violinist Lana Trotovsek has won admiration for her expressive playing and unique musicality. The Washington Post has described her as ‘Radiant’ and praised her ‘clean, refined tone with musical sense of phrasing and impeccable intonation’. She has captivated audiences with her ‘warm sound and formidable technique’ (La Vanguardia) and her talent of bringing ‘freshness, depth and insight’ (Broad Street Review) to her interpretations. Since her debut in 2012 with Mariinsky Theatre Orchestra conducted by Valery Gergiev, Lana Trotovsek appeared with some of the world’s finest orchestras. In 2014, she toured with the Moscow Soloists and Yuri Bashmet, and she recently performed Prokofiev’s Violin Concerto No.1 with the London Symphony Orchestra under Gianandrea Noseda. Her 2015-16 schedule included performances with Orchestra Teatro Verdi under Tan Dun, as well as playing with the Slovenian, Shanghai, Sarajevo, and Zagreb Philharmonic Orchestras, the RTV Slovenia, the Kalamazoo Symphony Orchestra and the Chamber Orchestra of Philadelphia, where she was described as “an emerging voice to watch” by Philadelphia Inquirer. Trotovsek has performed at some of the most prestigious venues, including the Wigmore Hall, Vienna’s Konzerthaus, Teatro la Fenice in Venice, Amsterdam’s Concertgebouw and Muziekgebouw in Eindhoven. Her talent has taken her beyond Europe to perform in China, Japan, the UAE, Canada, the USA and she has performed with many eminent conductors such as George Pehlivanian, Hans Graf, Uros Lajovic, Barry Wordsworth, Andres Mustonen and others. She has also featured as an artist at renowned international festivals including Rheingau, Aix en Provence, Shanghai International Arts Festival, Festival Internacional de Santander, Emilia Romagna, Ljubljana, Dubrovnik, Bad Kissingen, St Magnus International and Aldeburgh. Trotovsek was born in Ljubljana, Slovenia, to a family of musicians. At the age of 4, she began playing the violin under the guidance of Majda Jamsek. When she was 17 years old, her prodigious talent was recognised by Ruggiero Ricci, who mentored her at the Academy Mozarteum in Salzburg. During this period, she continued her studies at the Academy of Music, University of Ljubljana with Volodja Balzalorsky and Primoz Novsak. In 2005, her passion and skill was rewarded with the Prešeren Award, the highest university award for arts in Slovenia, following her performance of the Khachaturian Violin Concerto with the Slovenian Philharmonic Orchestra under the baton of George Pehlivanian. Trotovsek continued her studies at Trinity College of Music with Vasko Vassilev, Boris Brovtsyn and Rivka Golani and at the London’s Royal College of Music with Itzhak Rashkovsky, winning many international prizes. From 2011-13, she was the leading violinist of the Badke String Quartet, winners of the Melbourne International Chamber Music Competition. Lana Trotovsek lives in London and is a Professor at the Trinity Laban Conservatoire of Music and Dance. She maintains close ties to her home country, where she performs regularly, and is a visiting assistant Professor at the Academy of Music in Ljubljana. She plays the 1750 Pietro Antonio dalla Costa violin.